There is a BAT call. 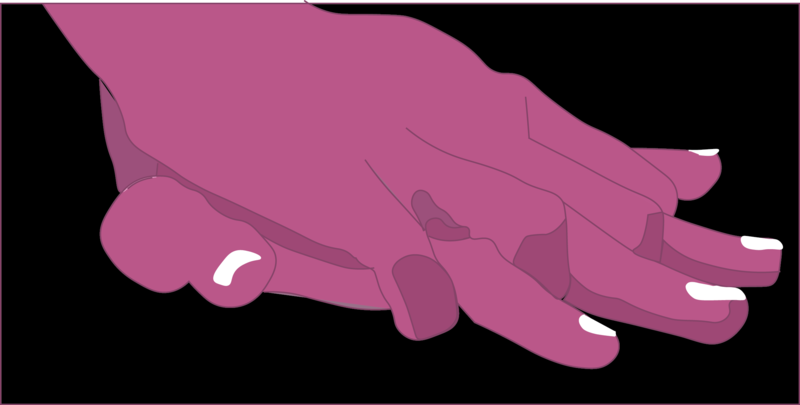 The ambulance are bringing a 72 year old woman who suddenly , in front of her husband, was seen to slump to one side and appeared to have a left hemiplegia. In transit to hospital she has become less responsive and has arrested in the ambulance. On arrival she is intubated, and chest compressions are continued with a LUCAS device (automatic external chest compression device) in the Emergency Department. She has an impalpable pulse. Her ECG shows electrical activity. This is “true” PEA. This is her subcostal view while the LUCAS is operating. 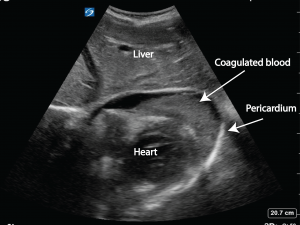 There is clearly a large pericardial effusion, some of which is echogenic suggesting a haemopericardium. Only a small amount of blood can be aspirated and there is no ROSC. 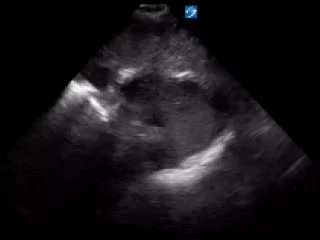 Note that there is still some cardiac contractility. The 2 most likely causes of haemopericardium causing tamponade and cardiac arrest would be a post infarct ruptured ventricle or a type A dissection with extension into the pericardium. 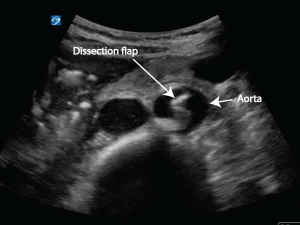 The abdominal aorta is immediately insonated and a dissection flap is visible. 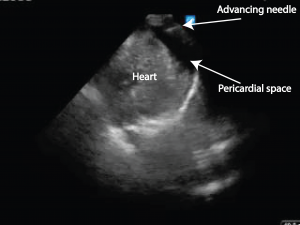 A clear cause for this woman’s cardiac arrest is therefore identified which fits her clinical story of acute onset left sided weakness followed by a decrease in level of consciousness and then cardiac arrest (dissection into the pericardium causing pericardial tamponade). She remains asystolic on ECG monitoring and the decision is made to remove the LUCAS device. 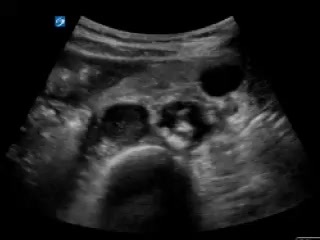 An ultrasound is quickly obtained parasternally. There is no cardiac activity. The patient is still in asystole. Resuscitation is stopped. 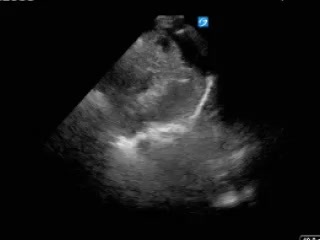 Point of care ultrasound is an improvement on the manual pulse check in cardiac arrest. It enables visualisation of the the myocardium looking for cardiac contraction. 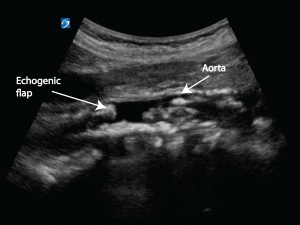 Point of care ultrasound can also help in identifying reversible causes of cardiac arrest such as hypovolaemia, pericardial tamponade, pulmonary embolism and tension pneumothorax and non treatable causes such as this Type A aortic dissection which was unsurvivable. The lack of cardiac activity in association with asystole triggered the end of resuscitation efforts. When do we terminate resuscitation? 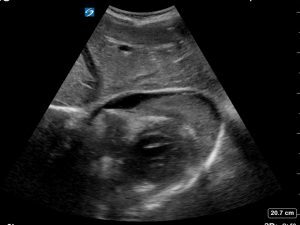 Termination of resuscitation should also include focussed point of care ultrasound findings. Prognostically a non contracting myocardium in cardiac arrest is not survivable and this should also be taken into consideration when deciding on when to stop CPR. 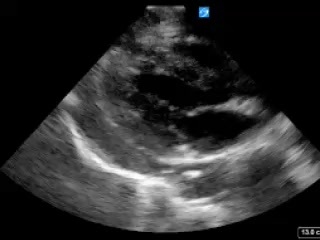 A recent prospective study on out of hospital cardiac arrest (1) found that cardiac activity on ultrasound was the variable most associated with survival following cardiac arrest. Cardiac activity on ultrasound was associated with increased survival to hospital admission and hospital discharge. Among 530 patients without cardiac activity, only 0.6% survived to discharge (compared with 3.8% of those with cardiac activity). In multivariate analyses, cardiac activity and initial rhythm of PEA were significantly associated with ROSC (return of spontaneous circulation) (odds ratios, 3.0 and 2.8, respectively) and with survival to hospital admission (ORs, 3.6 and 2.1, respectively). Cardiac activity was significantly associated with survival to discharge (OR, 5.7). In patients with asystole, lack of cardiac activity had a sensitivity of 90% and positive predictive value of 99% for non–survival to hospital discharge. 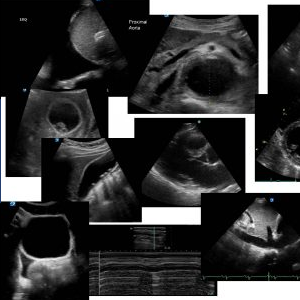 Focussed, point of care ultrasound identified pericardial effusion in 34 patients and suspected pulmonary embolism in 15 who received thrombolytic therapy. 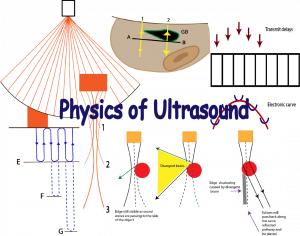 Teaching point: Point of care ultrasound in the context of cardiac arrest has been performed by many, but not all, emergency physicians for many years. 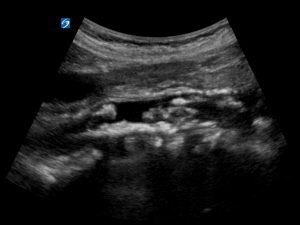 The ability to perform point of care ultrasound in this situation should be a mandatory core skill in Emergency Medicine. Resuscitation: 2016 Dec;109:33-39.Epub 2016 Sep 28.Emergency department point-of-care ultrasound in out-of-hospital and in-ED cardiac arrest. Gaspari R1, Weekes A2, Adhikari S3, Noble VE4, Nomura JT5, Theodoro D6, Woo M7, Atkinson P8, Blehar D9, Brown SM10, Caffery T11, Douglass E4, Fraser J8, Haines C12, Lam S13, Lanspa M10, Lewis M2, Liebmann O14, Limkakeng A15, Lopez F15, Platz E16, Mendoza M9, Minnigan H17, Moore C18, Novik J19, Rang L20, Scruggs W21, Raio C12. NEJM journal watch: October 3, 2016 Point-of-Care Ultrasound in Cardiac Arrest Daniel M. Lindberg, MD reviewing Gaspari R et al. Resuscitation 2016 Sep 27. This entry was posted in Cases, Dissection, ECHO, Cardiac arrest. Bookmark the permalink. Gee to think 17 years ago doing a STAT Echo. Pt. coded ( I was not in there way) I was yelled at belittled, later written up..and I still remember the nurse yelling at me to stop the Echo and get the machine out of there. And of course my boss and the Chief Cardiologist yelling at me how stupid I was for cont. doing an Echo I a dying heart. Now it is looked upon as being good thing. Yes, I remember that too. 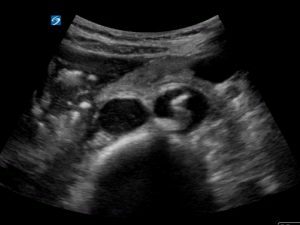 Ultrasound is still being frowned on when it is used in the ED. Lets make sure it becomes firmly entrenched as it should be.